With the SEASTRONG collection, Alpina Watches has made diving watch history since the 1960’s when the Seastrong “10” was already capable of reaching depths of 200m/660ft. 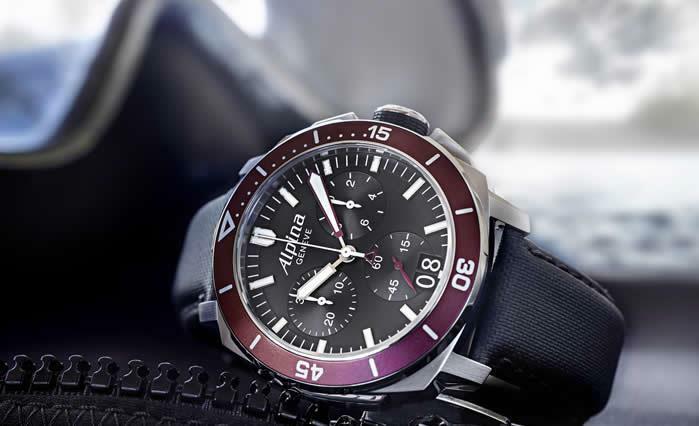 In 2015 Alpina reveals the Seastrong Diver 300 Chronograph Big Date. An extremely well readable professional diving chronograph range that is 300m/1000ft water-resistant, immediately recognizable due to its distinctive coloured unidirectional turning diving bezels and its oversized minute hand for optimal diving time readability. 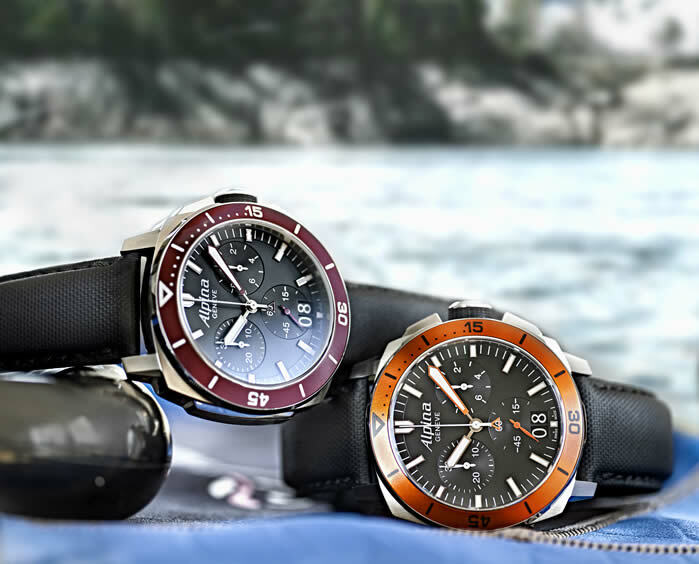 The all-new Alpina Seastrong 300 Diver Chronograph Big Date is a professional diving watch. Everything about this model is designed to cope with the most extreme conditions any professional diver could ever encounter, starting with water resistance to no less than 300 meters. That’s 1,000 feet below sea level, which means the watch can go to depths no human ever could. The Extreme Diver 300 has been designed with all necessary features that allow owners to get the information they need, when they need it, for a safe dive. The aluminum, unidirectional, turning bezel, turns in just one direction: anti-clockwise. With this “fail-safe” feature the number of elapsed minutes can never be accidentally decreased, only increased. In addition, the 60 minutes markers on the bezel are luminous, as are the dial indexes, which perfectly contrast against the matt black dial. The watch’s hands are luminous for maximum readability in low visibility conditions, and the minute’s hand is oversized to safely read diving time. The 44 mm stainless cushion shaped steel case, the screw-in crown and case-back, the scratch-resistant sapphire crystal, the robust, water-resistant, genuine leather strap and the beautiful engraving of the Alpina diving symbol the case-back are all distinctive functional and aesthetic features matching the requirements of divers and those of everyday wear of the watch. The range comes in 4 different models, each with a different bezel colour: bordeaux, grey, navy blue and orange. The extremely precise and reliable AL-372 1/10th of sec. Swiss quartz chronograph movement features 30 and 10 hour chronograph counters, add and split functions, big date and has a standard battery life of 48 months. Alpina, famous for its red triangle signature, is an independent, family-owned fine watchmaking manufacture based in Geneva, Switzerland. Founded in 1883, Alpina’s watchmaking history spans more than 130 years. A true pioneer of the Swiss watchmaking industry, Alpina has been the source of numerous innovations, patents and calibers. Alpina invented the concept of the sport watch, as we know it today, with the birth of its legendary Alpina 4 in 1938. Faithful to its long tradition of creating mechanical calibers, Alpina manufactures five in-house movements: the Tourbillon AL-980, the Flyback Chronograph AL-760, the World Timer AL-718, the Automatic Regulator AL-950 and the Small Date Automatic AL-710. Thomas Prescher Involved in Sensational Archaeological Project?